Current Obituaries From Busch Funeral and Crematory Services. Find a funeral home location near you. Family-owned and operated crematory. Plan for Cremation with Confidence™. Learn about burial service options. Ensure your final wishes are honored. Explore our guides, ebooks, brochures and videos. Learn how to Live Well, Plan Well and Leave Well. Conversation-starting questions and tips for in-depth discussions with your loved ones. Having discussions about life’s most important questions can be a rich and satisfying experience that helps us reaffirm to our loved ones the impact they’ve had on our lives. More importantly, it allows us to thank those who have been through life’s triumphs and tribulations. 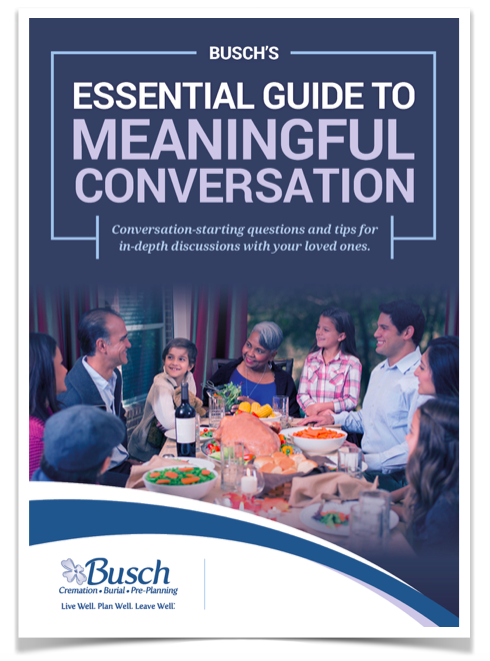 This guide is designed to help you engage in meaningful conversation with the people who matter most to you. From treasured possessions to favorite family traditions, the guide offers 25 sample questions that cover an array of different topics. A casual gathering of family and/or friends. How to initiate a meaningful conversation. What to ask your loved ones. How to make the discussion fun. Ready to engage in meaningful conversation? Fill out the form to the right.